A study has found more than half of girls in the US and the UK are 'overfat', putting them at risk of diabetes and cancer. These children may appear to be of normal weight, but having a waist circumference of more than half their height is enough to put them in the danger category. In the rankings of the world's 30 most developed countries, US schoolgirls are the fattest, followed by the UK on this measurement. On average, almost 87 percent of men and more than three-quarters of women in the list are 'overfat', storing their weight around their middle rather than elsewhere on their body. It raises fresh concerns about female weight gain - particularly around the stomach, which is the most dangerous - at a young age. The term overfat refers to the presence of excess body fat that can wreak havoc on health - even in normal-weight non-obese people. Collaborating with researchers in San Diego, the team reported earlier this year in the journal Frontiers of Public Health that up to 76 percent of the world's population may be overfat. Now these same researchers have focused their efforts on data from 30 of the top developed countries, with even more alarming findings. They found that, in the top overfat countries, 80 percent of women fall into this category. The problem is particularly pervasive in the UK and the US, where the Western diet is the universal preference. However, the researchers were surprised to discover that Iceland and even Greece - where people are generally thought to be healthier - had similar statistics. 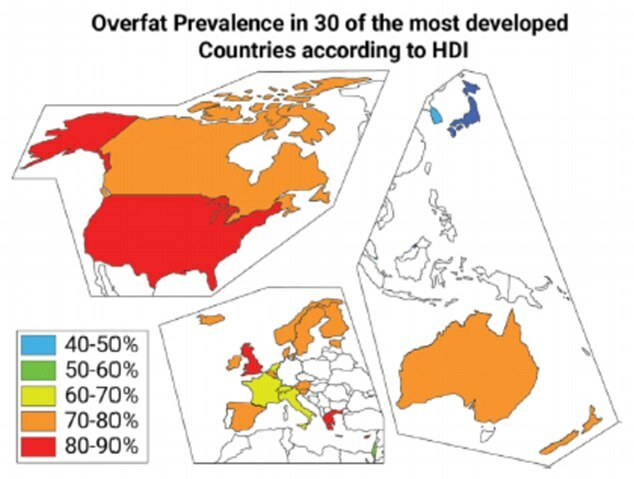 This trend may be bad news for developing countries as well, since they have followed the trend of developed nations in the growing overfat pandemic. In developed countries, up to 90 percent of adult males and 50 percent children may suffer from this condition. A recent rise in the amount of stomach fat, the unhealthiest form of excess body fat, has been observed in both adults and children. Naveed Sattar, professor of metabolic medicine at Glasgow University's Institute of Cardiovascular and Medical Sciences, said: 'Measuring the weight around someone's middle can be an indicator in adults of their risk of diabetes, heart disease, fatty liver disease and, when measured early in pregnancy, of the risk pregnancy complications. 'This is not the part of the body where women and girls tend to put on weight first so the fact that young girls in Britain are among the worst for this measure is a worry. The research team said that suggests a direct link to insulin-resistance, the body's natural propensity to convert and store carbohydrate foods as fat. The relationship between the overfat condition and poor health is a spectrum or progression in which the vicious cycle of excess body fat, insulin resistance and chronic inflammation lie at one end, causing abnormal blood fats and glucose, and elevated blood pressure, which then produces a variety of common diseases at the other end. Traditional means of assessment, such as stepping on a scale or calculating Body Mass Index (BMI), are ineffective at determining whether someone is overfat.